Lizzie tugged at the reins, steering Hunter and her little waggon onto the patch of dirt next to Laughing Wolf’s grave. She jumped down from the driver’s board and stood beside the freshly dug earth. She took Laughing Wolf’s coup stick from the waggon and planted it in the ground at the head of the grave. She got back onto the waggon and rolled out toward the edge of town. She could do that now, with King’s spell broken. They were all free to move on. Ernie was packing saddle bags on a horse outside his saloon. “Thought you were staying,” Lizzie said as she passed. It figured. Lizzie wouldn’t have wanted to stick around under Alfonse’s henchman either. But then, her plan had always been to leave. To get back to her old work, gathering investment information for businesses back east. Earning herself a nice Washington town house full of fancy dresses and parties. 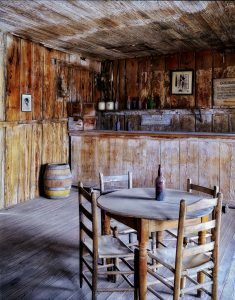 She rolled on past the saloon, the store, and the houses of the little frontier town. People peered nervously out from behind their curtains. Just past the end of the street, a body swung from the branches of a wind-swept tree. Death suited Alfonse King. Pallid skin contrasted with his sharp suit. The thugs who had left him to face the penalty for Laughing Wolf’s death were back. One of them had climbed up the tree to cut the body down. Two others stood below, ready to catch it. They turned as she passed. “Sheriff Figgis wants words!” another shouted. They picked up hefty sticks and started running after her. Lizzie felt annoyance as much as fear. All she wanted to do was leave town, but these idiots were making even that difficult. Without the magic of playing cards or a coup stick to help her, she wasn’t ready to deal with them. She snapped the reins and Hunter picked up the pace. Soon the men were left waving their fists in futility. Looking back, she should have felt triumphant. Instead, she felt ashamed. Was she really going to leave this place in the hands of men like Figgis? She wheeled the waggon around and headed back up the road into town. The thugs beneath the tree yelled in alarm as she thundered through them, knocking one to the ground. Other men emerged from a doorway at the far end of main street. Leading them was Figgis in his patched and dusty suit, a sheriff’s star gleaming on his lapel. Lizzie didn’t have a plan, but she had more righteous determination than she’d ever felt in her life. Pulling on the reins, she brought Hunter to a stop outside the tavern. Ernie stared at her in surprise as she leapt down and strode toward Figgis. Four men flanked the sheriff. Like him, they all had six-shooters at their hips. The men closed in. Figgis started drawing his gun. Lizzie had never been a soldier, a lawman, or a hired thug. But years of card tricks had sharpened her reflexes and the deftness of her fingers. With a single smooth motion, she stepped forward and punched Figgis squarely in the nose. As he staggered back, his grip on the gun loosened and she twisted it from his hand, spinning it around to aim at his so-called deputies. They stood stunned, guns half-drawn. “Not alone.” Ernie appeared around the waggon, a shotgun in his hands. His customers had emerged from the saloon behind him. Most of them were armed. The thugs exchanged nervous glances then raised their hands. Figgis flinched as Lizzie’s hand shot out, snagging the silver star off his jacket. Still aiming the gun with one hand, she used the other to pin the badge onto her chest. Around her, the townsfolk disarmed Figgis’s men. As Figgis and his men tramped despondently out of town, Lizzie turned to Ernie. Lizzie’s neighbours cheered as she made her way back to the saloon. She smiled. This place wasn’t so bad, for a one night town. That’s it for Lizzie Wayne and the Gamblers’ Frontier, for now at least. Next week, I’ll be starting a new science fiction series. If you’ve enjoyed these stories and want to support my writing, please consider buying one of my e-books, sharing this post with other people, or signing up to my mailing list. The mailing list gets you a free e-book and short stories straight to your inbox every Friday.